In 1988, I was invited to a party at Barry Rebo’s loft on 25th Street in NY. Rebo was one of the most aggressive early adapters in the production business. He had brought the first u-matic 3/4 inch decks from Japan, replacing film with videotape. Now, far ahead of everyone else, he was getting into HI DEF. The party was to celebrate the purchase of his Hi Def camera. It was the first Hi Def camera in the United State. Analog. NHK in Japan was his only client. The camera, which sat in his living room, was the size of a Volkswagen. It cost a million dollars. He had built a special van to drive the thing around. Each 20 minute tape cassette cost a thousand dollars. Nine years later, a broadcast quality Hi Def camera fits in the palm of your hands. The one pictured above costs $1200. It does not record on tape, it records on a card. 40 minutes per card. It is point and shoot. 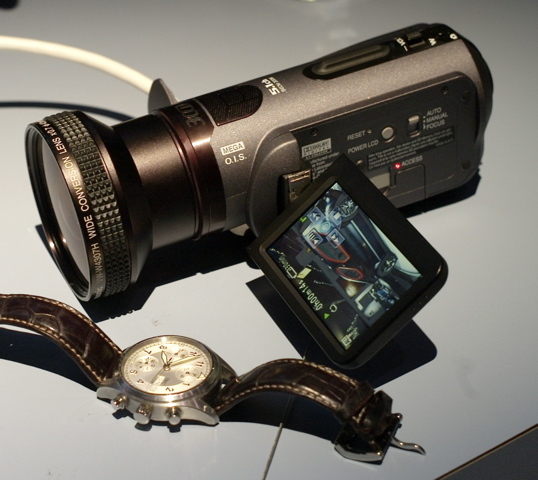 I saw this one at NAB and put my watch next to it to demonstrate how small it is. Do you really need a ‘cameraman’ to operate this thing? Or to carry it around? Isn’t that a bit ridiculous? Where is the rationale for ‘cameramen’ now? Television has reached the point radio reached a generation ago. The technology is small, simple, cheap and easy to operate. Just as a radio journalist carries his or her own digital recording equipment, now television journalists carry (or soon will) carry their own digital recording equipment. The days of the cameraman are over. (Let me make a correction here in deference to dedicated craftsmen like Jim Long. There will always be a place for cinematographers. Documentaries like Blue Planet from the BBC, or other high end works will always have a need for great cinematography. Day to day news is, however, another story entirely). There will be those who will say, “look how small that camera is. It isn’t real. No one will take a person carrying that seriously”. It is funny how we have this Soviet mentality when it comes to cameras – bigger is better. We don’t feel that way when it comes to laptops… or cellphones. No one says, ‘that cellphone is too small. You can’t use that cellphone to call a US Senator. That small cellphone is OK for calling your mother, but if you want to be taken seriously when you call someone important you better use a dial up phone’. Same thing when it comes to cameras. You can either change… or you can cling to a past that no longer exists. If you’re unhappy with this… call your mother. You can use your cell for that one. This entry was posted in Internet, Journalism, Online Video, photojournalism, Rosenblum, Technology, Television, TV News, TV Shows, video, VideoJournalists. Bookmark the permalink. The end of cameramen? I doubt it. Less of a market for a dedicated camera operator? Definitely. I do believe, however, that even when journalists take over the world of production there will always be a market for craft experts in communicating via pictures for particular projects. A nice camera though. I just finished a conversation with our VJ coordinator who brought up his opinion that even the Sony Z1’s we’re using for our VJ trial are too big and I’ve got to agree. You either need a camera big enough to rest on your shoulder or small enough to rest in the palm of your hand. In between is just annoying and difficult to hold for too long. One thing that was abundantly clear at Virginia Tech is that while larger cameras did call attention to our “presence”, the long lens (mine is a 20x with a doubler) permitted less obtrusive photography. The people with smaller form factor cameras were seen getting way to close to grief-stricken people. To be fair, so were many insensitive “pros”. I’ll say this, what you need nowadays, especially with the less sophisticated cameras, is storytellers. That’s what most cameramen are, and damned good ones at that! You say ‘nine years later.’ Don’t you mean 19 years later? Jeez… you are right. OMG how time flies! In fairness to the audience, Michael – you do have a huge honkin’ watch. Just as in quantum mechanics, where the act of measurement changes the reality of the event, you can’t show up at an event with a satellite truck or even a two-person handheld crew and not change the reality of the event. Production technology purists will complain this isn’t real HD, but you’re effectively making the more important argument that intrusive production technology distorts the real story. No contest as to which is most important.